This book review was written by Janos.nyc guest writer Roxanne Earley. So begins Ted Steinberg’s sweeping ecological history of New York City, an exceptional read about the significant environmental changes that have been taking place in the metropolitan region for 400 years. The author, a native Brooklynite and environmental historian, sets out to challenge the widely accepted belief that the New York area rose to prominence due to its function as a port, examining instead its relationship with land, particularly land in the intertidal zones. In short, the book posits that New York has been a very deliberate land reclamation project: turning wetlands perceived as worthless into highly valuable dry land, and reducing our overall biodiversity in the process. 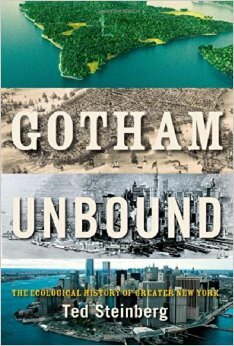 Gotham Unbound offers a comprehensive examination of the New York region, and while the primary focus is Manhattan, the book also discusses Flushing Meadows/Corona Park, Hackensack, and Jones Beach. There is also a very detailed section on the history of Staten Island and the gradual loss of its major wetlands. This regional focus allows readers to connect Manhattan with its surrounding backwater beach towns, farms and suburbs, and then contemplate how these areas have also undergone incredible changes. Steinberg does an excellent job demonstrating how increased human development has supplanted ecological communities in the region. Essentially, our relationship with ecology has evolved due to global events: the shift to regular shipping schedules, containerization and its exhaustive use of land, and the automobile age. New York, even what we have come to consider its ‘natural environment’ is decidedly molded by human minds, and that has been as much because of dominant global trends as local ambition. As Steinberg takes you on a 400-year odyssey examining the draining and filling in of marshes, the shrinking of the harbor, and the loss of biodiversity, he paints a brilliant picture of the environment that came before the New York that we know. He transports his audience to the forgotten shores of places like Flushing Meadow, Jamaica Bay, and Staten Island with vivid detail. A sense of loss settles onto readers as they move through the book, for a New York we can never get back. With it too, the author succeeds in provoking readers’ curiosity. What is happening on the shores of the Gowanus, at Fresh Kills Park, or along the Harlem River? Four hundreds years of history is a daunting task for any scholar to undertake – often we see texts that focus on a particular subject matter. Here, Steinberg dives into ecology and science without sacrificing the political intrigue that New York is so often known for. The machinations of those in power produced incredible outcomes for the surrounding landscape, and infamous New Yorkers from Boss Tweed to Robert Moses show up as shapers of Gotham. Steinberg balances the delivery of material well, and there are few dull moments in the text. In addition, data lovers will be pleased to note that a full 1/3 of book consists of additional charts, graphs, and notations. Ted Steinberg’s Gotham Unbound is published by Simon And Schuster (2014). Roxanne Earley is a writer and urban planner living in New York City. You can read more of her work here.